With this year marking the 25th anniversary of the Anaheim Ducks, the 25-year-old Gibson, entering his sixth NHL season with the club, decided to honour the special occasion with a colourful tribute of his own. Or in this instance, it would be tributes. The goalie mask the 39th overall pick from the 2011 NHL Draft will wear for most of the 2018-19 is a sight to behold. 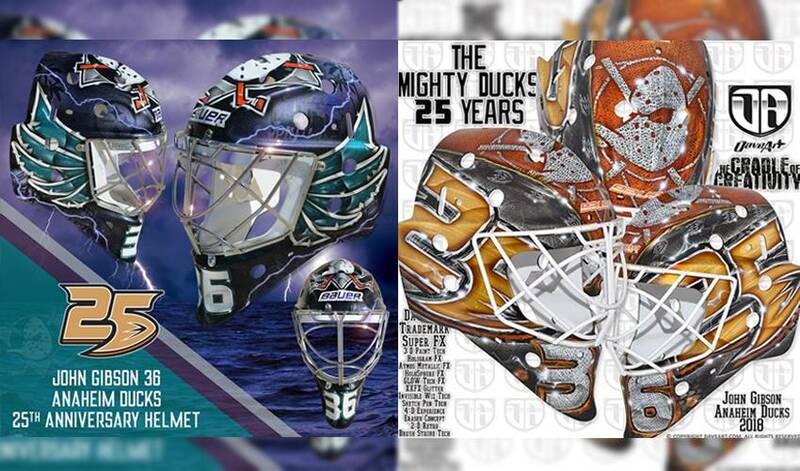 Created by famous goalie mask artist David Gunnarsson, Gibson’s mask showcases a huge old school Anaheim Mighty Ducks logo on the top and numerous duck foot logos on the side. It also includes the team's 25th anniversary logo, as well as No. 36 near the chin area. The mask he’ll wear when the Ducks don their special third jerseys is equally impressive. Featuring the club’s original logo on the top, it’s accompanied by teal-coloured wings behind a purple backdrop on both sides and a 3D metal leaf backplate that displays the names of the Anaheim players who won the 2007 Stanley Cup. You’ll also notice references to Gibson’s hometown of Pittsburgh, including the logos of MLB’s Pirates and NFL’s Steelers, along with the skyline of the city inside the outline of Pennsylvania. “I didn’t design that one,” Gibson told NHLPA.com about the alternate mask, brought to life by Shell Shock Designs & Paint. “One of our athletic trainers did it. I haven’t seen it live, but it definitely looks cool. Both of my masks are a tribute to the 25 years, but the one I’ll be wearing most of the time with our regular jerseys, I kind of wanted to get the different logos on there to remember the whole timeline of the team. Gibson, who sported a record of 31-18-7 with four shutouts in 60 games last year and posted a 2.43 GAA and a .926 save percentage, is hoping to make more than just a fashion statement when he’s between the pipes this year. The Ducks, who finished second in the Pacific Division in 2017-18, were swept by state rival San Jose in the first round of the playoffs. He’s eager to unveil his new looks.